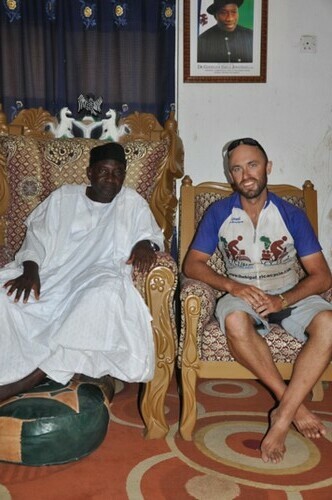 The Emir of ‘Old Muri’ took care of us in Jalingo. By this I mean we received a reduced rate at his brother’s Guest House and had breakfast and dinner delivered free of charge to our room by one of his ‘personal assistants’. We had first met the Emir, whose long name I quickly forgot, sitting on a palatial throne and swathed in a white robe several days earlier in ‘Old Muri’ itself. Why this man, (who had obviously received word of two foreigners riding bicycles through his chiefdom) decided to send his messengers out to summon us to his home I’m not sure. 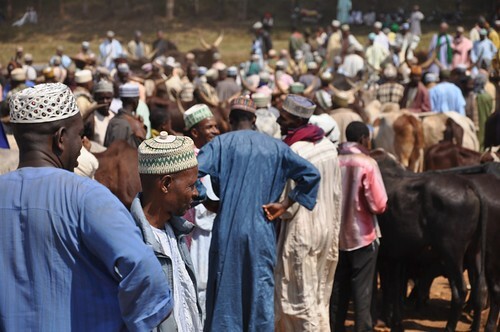 Old Muri is a small village on the north bank of the Benue River in Taraba state. Between the sandy streets and mud-brick huts there is little to show for what the Emir claimed to be a 450-year history. I missed the details as we sat opposite him on a sofa in his front room whilst a servant crawled across the carpet to bring us bottled water and fresh papaya. There was some mention of warring tribes, which is probably the history of much of Nigeria from the very beginning. 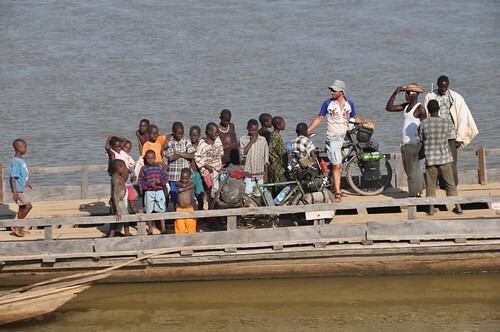 We had used the Emir’s personal ferry to cross the Benue River and been told to contact him when we arrived in Jalingo, which is just what I did. To what extent the Emir was expecting me to ‘dash’ him in some manner for all this hospitality involved I’m not sure. I ought to have asked him to introduce me to one of his many daughters. 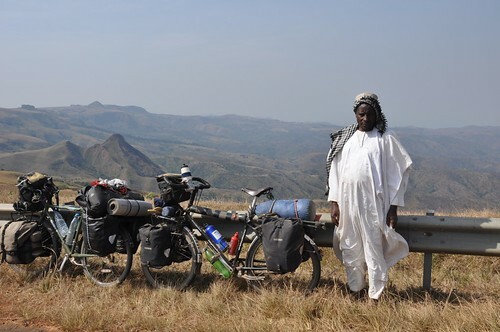 Perhaps treating and caring for two foreigners foolish enough to ride bicycles through his remote chiefdom was merely a statement of his power and generosity. During our pampered stay in Jalingo Hiromu and I had clothes made. Having bought the material from a small market somewhere near Yankari National Park the week previously I’d carried the 18 yards of colourfully patterned cotton (purchased for around $20) and was waiting to find a moment where we might rest and locate a tailor. The latter are easy to find throughout Africa and in a little over 24 hours we were exchanging $15 for 4 shirts, 3 pairs of trousers, a kaftan and bag. I thought this might be an occasion for Hiromu to throw away his hole-ridden shirts, but he seems content to wear them until they fall off. South from Jalingo the old tarred road quickly deteriorated. In a four-wheeled vehicle this would be a bone-crunching journey over crater-sized pot-holes, but on a bicycle it is merely a case of finding the right line and weaving ones way between the hollows. Our celebrity status continued as we passed through villages and sought permission at the end of the day to pitch the tents besides schools or churches. This has rarely been a problem anywhere in Nigeria, other than having to convince dumbstruck locals that we will not be cold or uncomfortable sleeping on the ground. Crowds of children and men will often gather to watch in fascination as the foreign objects are erected. Many refuse to believe that anyone would wish to travel by bicycle and not be profiting directly from an employee or government for doing so. Wearing a shirt with ‘Against Malaria Foundation’ written on the back often involves extra explanation, which is usually a case of saying ‘no’ I don’t carry mosquito nets to distribute and nor does the charity financially support me. Having company on the road helps to disperse all the attention one receives for travelling in a region that sees few foreigners. Hiromu and I have different cycling speeds, which is partly because his bicycle is far too heavily laden with unnecessary things like an extra sleeping mat and large rucksack, which gets rarely used. When I first met Hiromu in Morocco his panniers had the words ‘Running w. E’ written across in large white paint. Since Ghana the words have been taped over, for it seems Emily, the long-term girlfriend whom he left behind in Japan and whose name he dedicated his trip to, calling it ‘Running with Emily: Dreams do come true’ has decided that a 5-year wait for her loved one’s return is a bit too long. ‘Running w. E’ continues to be written on the bicycle frame and mudguards and Hiromu asked me whether transferring the meaning of the letters ‘w’ and ‘e’ to ‘wandering’ and ‘Earth’ would now be more appropriate. I explained that ‘Running wandering Earth’ makes little sense. How about ‘Running without Emily’ I suggested. Hiromu is yet to be convinced. 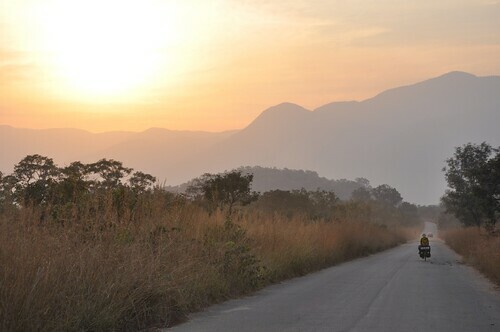 The scenery becomes more mountainous as one heads south through Taraba state towards Cameroon. Behind thatched huts and harvested fields of maize, yams, and peppers rise green boulder-strewn slopes. 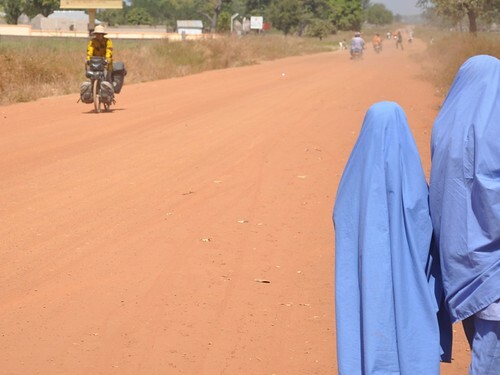 The quiet and now better-paved road begins to undulate and it is at this point that locals seriously shudder with disbelief that you intend to cycle up onto the Mambilla plateau. This is a high grassland area of rolling green pastures, unlike most of the rest of Nigeria. And it is indeed a challenge to reach; 16km of mostly steep gradients and sharp bends bring you out of the familiar lowland heat to a cool alpine freshness somewhere above 1500m in altitude. Here cows graze and wild flowers grow at the roadside. Tin-roofed farm houses lie sheltered and hidden within gentle valleys where wooden picket fences divide the land. To look at the landscape you would never guess it was African. I could quite happily pass more time here. 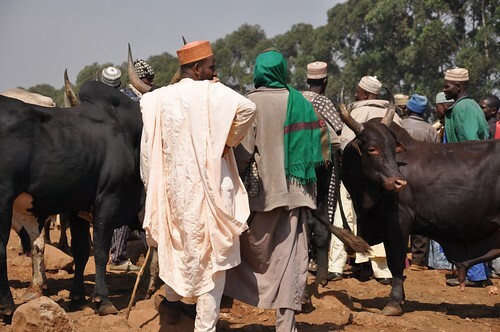 A few days ago we were lucky enough to pass a weekly cattle market where hundreds of cows had been walked from miles around by their Fulani and Hausa owners to be bought and sold on a hillside. There was no fenced enclosure. The animals stood huddled together whist young boys waited on guard with sticks in case one decided to wander or charge off. 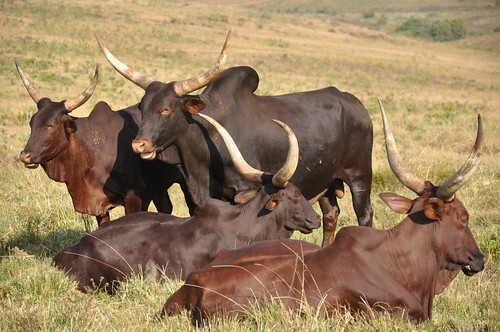 The cows here look much better fed and healthier than the anorexic-looking animals one sees throughout much of west Africa. The tarred road on the Mambilla plateau ends in the town of Gembu, which is where I’m writing this from now. Distances of 40, 80, 300 and 1000km have been given to me when I’ve inquired how far it is to the border with Cameroon. It is much better, although not always anymore accurate, to ask the travelling time in such situations. Two hours by motorbike seems the consensus, which on an untarred mountainous road probably puts the distance somewhere between 40 and 80km. All going well we should cross the border later today or tomorrow. Before leaving the 16th country on this journey I want to say a few parting words. During the months leading up to my arrival in Nigeria very few people had anything positive to say about the country. I now wish to say how very misinformed their impressions were or misguided their experience in Nigeria was. My time here and the broad spectrum of people I’ve met have proven the very opposite. From the stranger who disappeared with my $100 note to change on the black market, to the farmers who’ve given me free fruit, school teachers, chiefs and pastors who’ve provided safe places to sleep in my tent at night and the many other Nigerians who’ve been full of energy, generosity and a sense of humour no matter what circumstance they found themselves in. They have all made the last seven weeks a very memorable one in the life of the Big Africa Cycle. I wonder how Cameroon will fare in comparison. Hi Peter, my sister in law is from Niger and now lives in Central PA. She’s awesome. I was wondering if you went there in your travels and what you experience was like there. I never went to Niger and I’m trying to work out where ‘Central PA’ is? Pennsylvania? I know a chap called Bram Stoker who lives there. Well done Pete and I am happy you had a good time in Nigeria. Hope Cameroon will change from the open bar you have experienced until now. I have some friends in Tanzania, but it will depend on your planned route. Let me know when you get close and where you go and I will introduce you. I might even be there myself for a new project. ps: Could you add WorldOnaBike.com (my current Panam trip) and BikeTravellers.com (free weblogs for cyclists) to teh resources page? @Harry, BikeTravellers.com, Thanks Harry. Will let you know Tanzania route plan in due course and add those links when I get a mo. your words on Nigeria are revealing a side of the country I had never anticipated – it all sounds very interesting. Some witty writing too – poor Emily. I’d certainly like to see some more photos, especially of the high plateau area. A profane question: I’m thinking of getting a Thorn bike, but hearing a few negatives about the quality and robustness of the paintwork. What is your experience here? How is the paintwork holding up under all that dust? @Robert, Beneath the dust the paintwork on my Thorn seems to be holding up fine. If you are embarking on a big/challenging trip then a Thorn Raven is a good choice, although I didn’t find SJS Cycle’s customer service all that friendly. Delighted to see your experience of Nigeria was the same as ours. 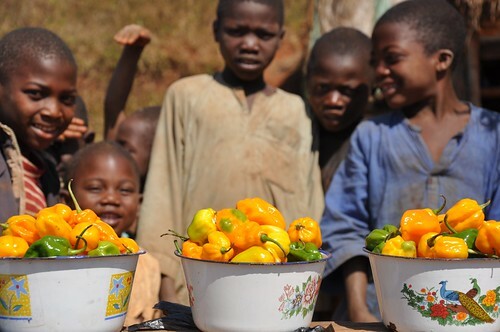 We just LOVED it & found Cameroon to be equally as welcoming & friendly. Hello Peter, it’s lorie from Abuja, Nigeria..i am so glad u were able to make it through to Cameroon, been reading your blog and i always find myself touched by the experiences u ‘v had during your stay in Nigeria, still like the coat with slippers experience and very happy when i found out u had a riding friend,glad that guy didn’t run away with your money……. will continue to follow u till u reach your destination. Always take care, extend my greetings to Hiromu..
Looks like you are finally back in full stride riding and writing stories and creating new ones. Good to see your email in my inbox regularly. Keep up the cause and the riding. You are an inspiration. Please don’t forget that ever. 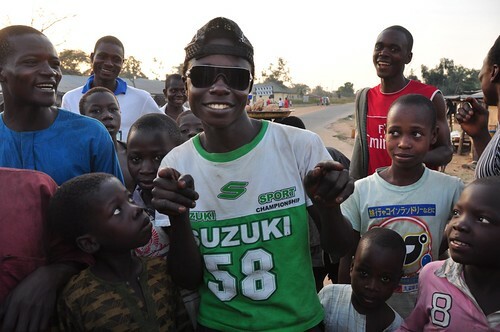 Thanks for the insider look at Nigeria! Can’t wait to hear about Cameroon. 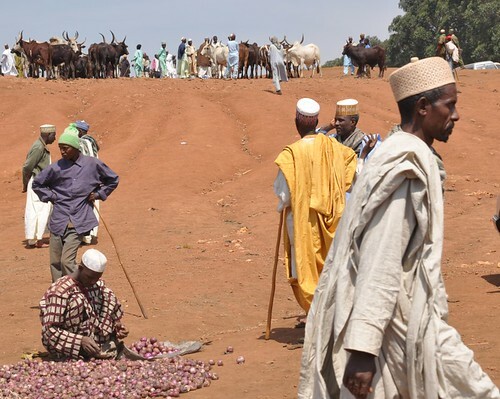 LOVE the Fulani images… I bet you’ll find much of Cameroon to be very similar.